Develop your own creative approach, no matter what your skill level with The Urban Sketching Handbook: Reportage and Documentary Drawing. 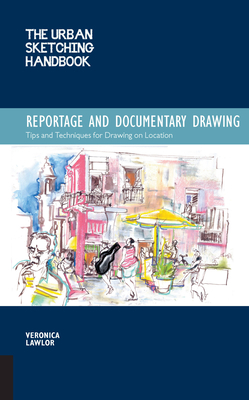 The third volume in The Urban Sketching Handbook series, Reportage and Documentary Drawing, is about drawing as a form of journalism or documenting life. This includes drawings events such as parades, music performances, sporting events, speeches, and can include everything from newsworthy political events to simply documenting a day's adventures. It's about being attentive to your surroundings, and telling that story through your sketches. Artist Veronica Lawlor explains how to use art to find and tell the stories around you. From visual journalism to simply sharing your emotional experience of a place, a reportage illustrator has something to say to their audience. Just as there are all types of written stories to be told, mystery, horror, romance - this volume of The Urban Sketching Handbook series reminds artists, sketchers, doodlers, and illustrators that there are all types of visual stories waiting to be told. And the next step is to go out and tell them!